This turned out to be rather easy: Some Kconfig and Makefile altering and I could build a Kernel which was configured for no-MMU configuration and the ARMv7-M instruction set (-march=armv7-m -mthumb). I decided to use a “eXecute In Place” kernel image (xipImage) which is located at 0x8f000000. I also enabled Vybrid low-level debug support on UART2. By default, the Cortex-M4 is not the boot CPU on Vybrid. 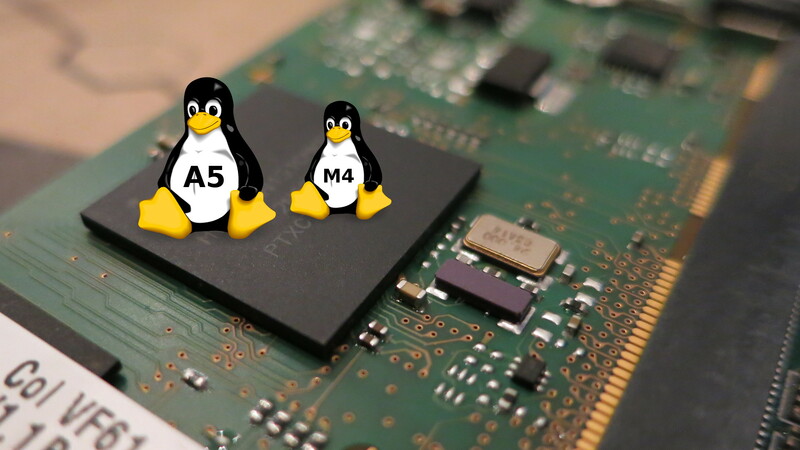 So the Cortex-A5 can boot the whole Linux, while the M4 is still in freeze mode. This allows us to use Linux as boot loader for the secondary M4 core. This comes in convinient, since we can use just scp to put new kernels on the Linux filessystem, which we later load to the M4. Booting the M4 is not very hard, its just writing the entry address in a register and unfreeze it (enable the clocks). I hacked a small utility which does this from user space: m4boot. This utility loads the Kernel as well as the device tree file into a given location (this is currently hard coded to 0x8f000000UL and 0x8fff0000UL). Then, the utility sets the entry point (SRC_GPR2) and the device tree binary location as argument (SRC_GPR3) and starts the M4 core. (we need to open the device because the driver enables clocks only when the device is open). Error: unrecognized/unsupported machine ID (r1 = 0x00000001). Nowadays, ARM kernels require the register r2 to point to the device tree binary in RAM. It is not possible to set the r2 register of the M4 directly from the A5, hence we need a minimal boot loader running on the M4. For now, I just hacked that in head-nommu.S. I opted to use BusyBox as base system. That’s it! With that we have a working Linux on the M4. From here, it would be easily possible to enable other peripherals which are supported, for instance GPIO, I2C or even Ethernet. My changes are available through the GIT repositories mentioned below. But if accepted, I will try to push initial support to mainline too. Thanks to Catalin Marinas, Jonathan Austin and Uwe Kleine-König who pushed support for ARMv7-M and Cortex-M3/M4 in mainline, without their ground-work this would not have been that easy.